Are you looking for a perfect white smile? 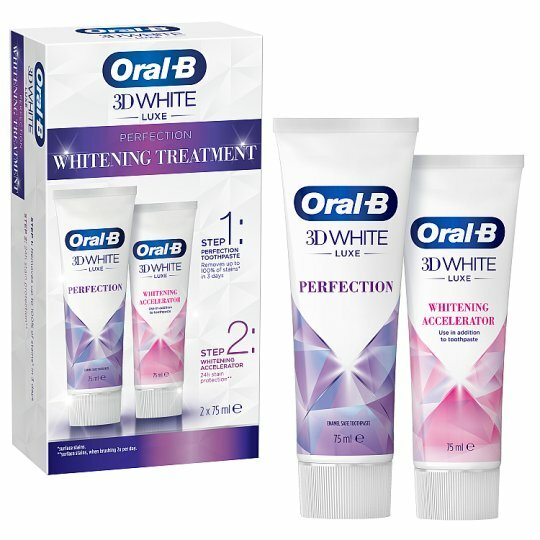 Try the 2 steps Oral-B 3D White Luxe Whitening Treatment. Step 1 use 3D White Luxe Perfection toothpaste to remove up 100% surface stains in 3 days thanks to its stain dissolving technology. Step 2 use 3D White Luxe Whitening Accelerator to amplify whitening results and to protect from future stains for up to 24 hours when brushing twice per day. Want to get closer to perfect white and care for enamel? Step 1 - Brush with 3DWhite Luxe Perfection toothpaste. Step 2 - Brush with the Whitening accelerator to boost and protect your teeth whiteness via removing surface stains.